So good it’ll rock your socks off. Along the hallowed halls of The Metropolitan Museum of Art (MET) that share years of art, many of the Greek and Roman variety, comes a new exhibition celebrating a musical movement that has rocked the music industry for years: Rock & Roll. I’m fairly aware of the fact that many fans of the genre appreciate art that the MET offers and even, dare I say, the MET Gala itself. Yet, there’s something fantastic about the image of a barrage of black t-shirt wearing rock & roll fans making their way through the pristine halls of the MET. Although, what better place to showcase the iconic instruments that defined the performances and songs of one of the most popular genres of the twentieth century. 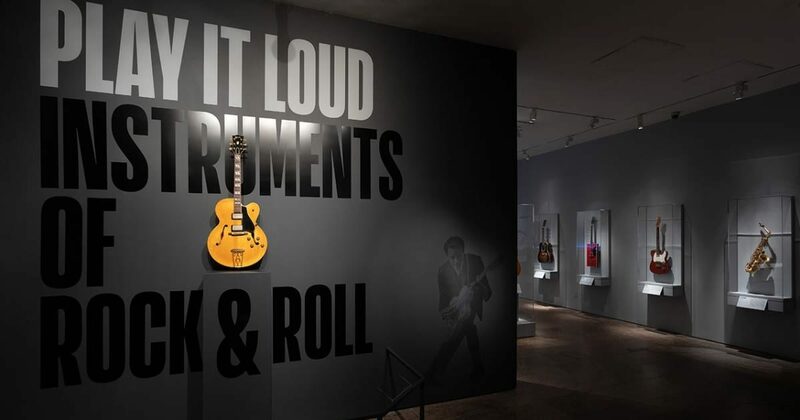 “Play it Loud: Instruments of Rock & Roll” offers audiences a comprehensive guide through the influential genre, displaying the instruments and objects used by artists to convey the innovative, experimental, passionate and rebellious spirit of rock & roll. The exhibition is organised by the MET and the Rock & Roll Hall of Fame. Director, Max Hollein, said that pitching the exhibition was a daunting task. “Pitching an exhibition about Rembrandt or Michelangelo or Greek sculpture—that’s pretty easy but pitching an idea about the instruments of rock and roll is a bit more complicated. Indeed, once the exhibition had been approved, asking the world’s most famous musicians to give up their beloved instruments was similarly challenging. The scope and mission of the exhibition, however, changed many rockstars’ minds,” Hollein said in a press conference. 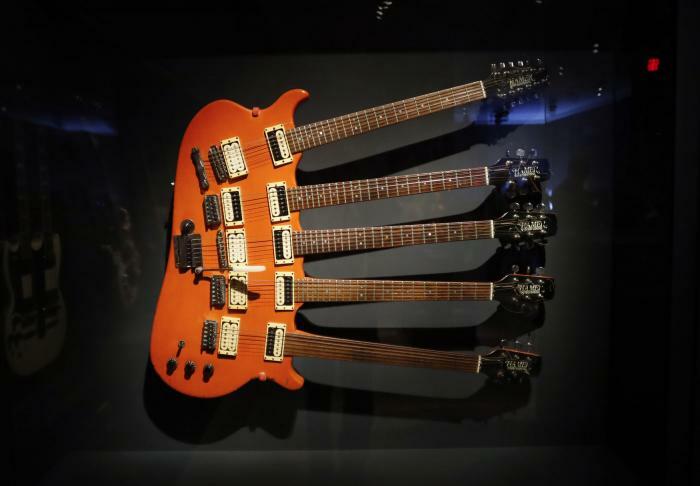 Organised thematically, the exhibit begins with instruments that paved the way for rock, such as Muddy Water’s telecaster and the original Fender Stratocaster and Gibson models. Continuing on, an array of guitars that shaped the artists that held them are shown next. Jimi Hendrix’s electric guitar, Love Drops, originally decorated by himself, Eric Clapton’s Blackie, and Joan Jett’s Melody Maker, are just a few of the instruments featured in the Guitar Gods portion of the exhibition. Instruments that defined specific performances were not forgotten; Jimmy Hendrix’s guitar that was burned at a sacrificial fire at the Monterey Pop Festival and a sculpture made from what was left of Peter Townshed’s smashed Gibson are also featured in the exhibition. Some instruments that aren’t typically considered rock instruments are also being showcased for their role in creating the experimental sounds of many iconic performances, such as a Rolling Stones violin and the sitar used by Ravi Shankar in his performances in the West that influences Western artists from John Coltrane to the Beatles. The exhibit was also expertly organised to vary through different mediums that reveal the story of rock & roll. Classic rock music sounds from the speakers throughout the installation, many of which feature the instruments in those same rooms. Videos of artists sharing their significance are also on display, as well live performances from Joan Jett, Van Halen and Eric Clapton projected for a seated audience. The fact that this exhibition spills over the halls filled with Greco-Roman art allows for a perfect contrast of the twentieth century rock world rich with its own history. It’s safe to say the MET and the Rock & Roll Hall of Fame have done the genre justice by offering an exhibition that celebrates rock’s legendary sound, status and identity within the music industry. Let us know if you’re a fan of Rock & Roll in the comments down below!